A very rare and desirable, ca1889 Cast Iron, “Floral Safe” Floor Safe form, Still Bank manufactured by Kyser & Rex and a fantastic addition to any Collection! 5 5/8" tall and 4 1/8” by 4 1/8” at the base. An internet search turned up no information on the Cast iron Bank. 6" tall and 4” by 2 3/4” at the base. It is made in the form of a Floor Safe and features a single dial, brass combination lock (we have the combination). A very rare and desirable, 1889 Cast Iron, “Arabian Safe” Floor Safe form, Still Bank manufactured by Kyser & Rex and a fantastic addition to any Collection! 5 5/8" tall and 4 1/4” by 4 1/4” at the base. 4 1/8" tall and 3” by 2 1/8” at the base. It features a single dial, brass combination lock (we have the combination). Text cast into the face of the Safe reads “Ideal Safe Deposit”. It stands on four integrally cast, non-turning wheels and is not marked in any way. 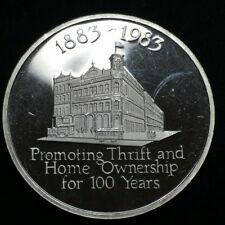 The reverse side of this coin features their slogan and belief. Limited Edition, serialized on edge #0135/0341. Coin is hallmarked on edge of coin ".999 Fine Silver". This bank that was established in 1883 is no longer an active bank, it was acquired by First Charter bank. 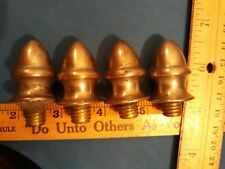 COMPLETE SET OF 4 Antique Safe Acorn Finials Halls Victor Baum Alpine ANTIQUE ! Set of 4 matching antique safe finials. Excellent ready to use condition one is dented. IT WAS MADE BY THE IDEAL MFG CO. c1890 WITH A UNIQUE SPRING LOADED LOCK ( I DO NOT KNOW THA COMBINATION ). THIS IS A HIGHLY DETAILED CAST IRON BANK ( SEE THE PICS IN CLOSE UP ). THIS ORIGINAL BANK WILL MAKE A EXCELLENT ADDITION TO ANY COLLECTION. Its safes and vaults were renowned for their strength and precision manufacture: As for Mosler, several Mosler vaults installed in Hiroshima's Mitsui Bank building prior to WWII survived the nuclear attack. Very quickly. (1 DEPOSITOR & 1 GUARD KEY). LeFEBURE SAFETY. With One Depositor Key. LeFEBURE MODEL No. 7302. High Quality LeFebure Lock. and at a reasonable price ! Each lock is in very good condition and operates smoothly. Ideal for build in in variety types of safe deposit boxes,vaults and many others where high security level is needed. The lock works pretty fine without any difficulties. 11cm X 11 cm (4,3"X4,3") is the lock. Its safes and vaults were renowned for their strength and precision manufacture: Several Mosler vaults installed in Hiroshima's Mitsui Bank building prior to WWII survived the nuclear attack. Very quickly. And will glow under UV black light. This is an original Diebold 175-05 right-handed safety deposit box. If you're a lock collector, don't get taken-in by a "reproduction" lock that is "like a Diebold lock.". Get an actual Diebold lock manufactured by Diebold. THIS IS A HIGHLY COLLECTABLE CAST IRON SALESMANS SAMPLE BANK MADE BY THE FIDELITY SAFE CO. BANK ONLY ! I DO NOT HAVE THE KEY. THIS ORIGINAL BANK WILL MAKE A EXCELLENT ADDITION TO ANY COLLECTION. Vintage Safe Deposit Box - Large 19" x 13" x 10"
Mrs. Cowan. hand painted in Gold. There is no key but It is not locked. Great for storing all kinds of valuables - rigid and durable storage solution. ANTIQUE ORIGINAL c1887 CAST IRON COLUMBIA BANK GREY IRON CASTING CO. IN EXCELLENT AS FOUND ORIGINAL CONDITION. COLUMBIA BANK ONLY ! THIS IS A HIGHLY COLLECTABLE CAST IRON BANK ( SEE THE PICS IN CLOSE UP ). THIS ORIGINAL BANK WILL MAKE A EXCELLENT ADDITION TO ANY COLLECTION. Electronic Keyless Deadbolt lock with 6 user codes. Never fumble for keys again. This electronic deadbolt features a lit keypad for easy viewing in the dark and a radio frequency remote. The remote can lock/unlock the door from up to 30 feet. IT WAS MADE BY HENRY C. HART MFG CO. CO. " SAFE DEPOSIT " BANK ONLY ! THIS IS A HIGHLY COLLECTABLE CAST IRON BANK ( SEE THE PICS IN CLOSE UP ). THIS ORIGINAL BANK WILL MAKE A EXCELLENT ADDITION TO ANY COLLECTION. IN EXCELLENT AS FOUND ORIGINAL CONDITION. THIS IS A HIGHLY DETAILED CAST IRON BANK ( SEE THE PICS IN CLOSE UP ). THIS ORIGINAL BANK WILL MAKE A EXCELLENT ADDITION TO ANY COLLECTION. During World War II, it built gun mounts for the United States Navy and was engaged in projects related to the atomic bomb. The uranium slugs were machined from uranium billets.". Herring Hall Marvin. THIS IS A HIGHLY DETAILED CAST IRON BANK ( SEE THE PICS IN CLOSE UP ). THIS ORIGINAL BANK WILL MAKE A EXCELLENT ADDITION TO ANY COLLECTION. Good used condition with a handle on one side and a handle and clasp on the other. THIS IS A HIGHLY DETAILED CAST IRON BANK ( SEE THE PICS IN CLOSE UP ). THERE ARE NO CRACKS, BREAKS OR REPAIRS AND THE COMBINATION IS WITH THE BANK. KEYSER & REX, MADE IN USA, Patented 1890. 1890 TOWER BANK. CAST IRON BUILDING with SAFE. CAST IRON & ANTIQUE TOYS ! VERY NICE ORIGINAL FINISH, DOOR IS LOCKED. ALL ORIGINAL EXCEPT 1 HINGE PIN REPLACED BY A NAIL. Has no key and does not lock. DIEBOLD 120HR TIMELOCK MOVEMENT WITH BRAND NEW TMI ESCAPEMENT, VAULT/SAFE READY. THIS IS A UNIQUE CAST IRON BANK WITH TIN SIDES ( SEE THE PICS IN CLOSE UP ). THE COMBINATION IS CLOCKWISE TO 1 AND BACK COUNTER CLOCKWISE TO 4. THIS ORIGINAL BANK WILL MAKE A EXCELLENT ADDITION TO ANY COLLECTION. BASS HERMANOS y Cia ". SAFE BOX ADVERTISING PLAQUE. SOLID NICKELED BRONZE. VERY NICE and OLD. IN GOOD OVERALL CONDITIONS. WIDE: 6" (15,3 Cms). TALL: 3-5/8" (9,2 Cms). Great looking piece in Excellent condition. Looks like a bank or safe but with drawers it might be sewing box. Missing bottom drawer. Drawers lined with felt. Front corner doesn't look like it had a rivot. "Morris & Ireland's NEW IMPROVED EIGHT-FLANGE Fire-Proof Safe. Condition: - Displays with evidence of aging, flaws and wear, as seen in HUGE scans far above. The only 8-Flange Safe made in the World. Four-Wheel Locks / Inside Iron Linings.". Old Antique Filigree Cast Iron Safe Bank Patent 1886 Dollhouse Miniature Too! 3 1/4" tall x 2 1/2" wide x 2 1/4" deep, this cast iron filigree bank is in excellent condition with no cracks ort breaks. You don't see many iron banks dated, but this one has a horseshoe with a patent date of 1886 inside. What you see in the photo is what you will receive. Check out my other auctions and store items for more great vintage items. Be sure to add me to your favorites list! Check out my other items! Feel free to ask any questions you may have.Any questions about the item please contact me as I will answer all questions as soon as I can. Shipping will be calculated. I do combine shipping when possible. ANTIQUE ORIGINAL c1891 CAST IRON J. & E. STEVENS ''SAFE'' BANK LOOK ! !